Candle mold accessories make candle making easier. 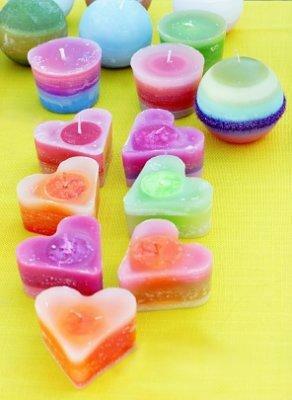 Candle mold accessories can be useful to help the candle making process a little easier. From lubricants to mold sealers, these tools are not always necessary for successful candle making, but they sure do come in handy! Candles have been made for centuries, and it's true that early candle makers didn't have all of the convenient accessories and materials that we have today. It is certainly possible to make beautiful and functional candles with just the basic tools and materials needed: wax, a wick, and a mold. There are several types of accessories available for candle molds. Here are some that are fairly common and easy to find. One of the most common problems candle makers face is releasing the finished candle from the mold. No matter what material your molds are made from, there is a risk that the cooled wax just won't budge from the mold. Candle release agents help to lubricate the mold, making removal much easier. Most candle mold manufacturers recommend using a release agent at least the first time that you use a new candle mold. Always check the label of a release product to make sure it's suitable for the type of mold you're using. Glue dots or "wick stickums"
Choosing a wick bar or other system for centering and holding a candle wick can be a process of trial and error. Start off with a simple bar product that will work for multiple types of molds. There are still more candle mold tools out there for you to try. Here are some of the less common but still sometimes useful accessories. Mold weights - mold weights are used with metal candle molds when they need to be placed in a water bath. The weights prevent the filled molds from floating up to the surface. Mold cleaners - Candle mold cleaners are usually unnecessary, since you can effectively clean your molds with household products. Fluted or tapered cutters - These little devices cut the bottoms of taper candles so that they will fit into standard sized candle holders. Flat candle cutters - Also called levelers, these tools use heat and/or a sharp metal cutter to give finished candles, such as votives and pillars, a perfectly flat bottom. Candle mold holders and tongs - Mold holders and tongs are similar to the equipment used in canning, allowing you to safely handle hot molds full of melted wax. Whether you're a hobbyist or a professional candle maker, these accessories can save you time and frustration.